The Barrage family is the first to feature the AXIS Assist. They offer quick, one-handed opening and can be operated equally with either hand. The original AXIS Assist now with G10. 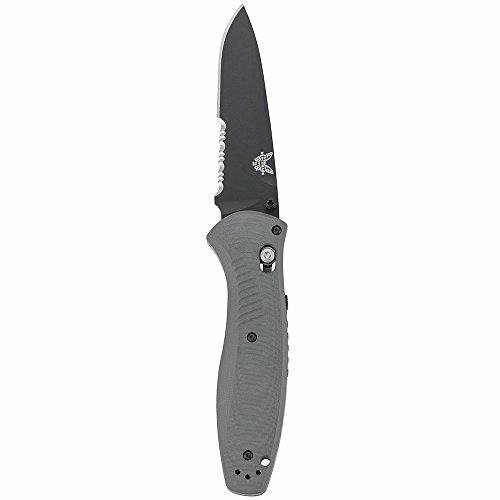 Gray G10 enhances the look and feel and upgraded blade steel offers enhanced edge performance. The same awesome mechanism with a new look and feel and a performance upgrade. What's not to like? Intended for both Everyday and Outdoor use, our Barrage family have a standard clip type with a reversible tip-up clip position. Our Barrage 580-2 has a lanyard hole. Specifications: Designer: Osborne | Mechanism: AXIS-Assist |Action: Assisted-opening | Blade Steel: CPM-S30V (58-60HRC) | Blade Length: 3.60" (9.14cm) | Blade Thickness: 0.121" (3.07mm) | Open Length: 8.40" (21.34cm) | Closed Length: 4.80" (12.19cm) | Handle Thickness: 0.65" (16.51mm) | Weight: 4.94oz. (140.05g). WELL-DESIGNED: The Barrage family is the first to feature the AXIS Assist. The Barrage 580-2 can be opened and closed quickly with either hand. ALWAYS READY: The 580-2's quick, one-handed opening makes it easy to hold and use. The reversible pocket clip offers ultimate accessibility. VERSATILE: The Barrage 580-2's drop-point, utility blade style and all-around functionality make it ideal for everyday use and outdoor activities.